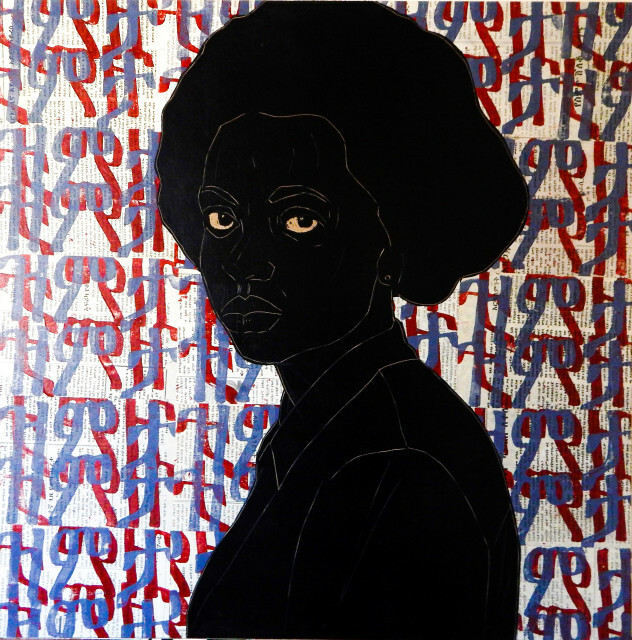 In the woodcut characters that populate Ethiopian artist Ephrem Solomon’s oeuvre, amongst the geometric shapes that fill the backgrounds, and the etched lines that stretch around mouths and foreheads, it is their gaze that draws us. At times confrontational, at others, looking off into an unseen distance, eyes are doleful, hopeful, despairing and questioning. They brim with emotion, and time, memories and experience are literally carved into faces, evident in under-eye bags, laugh lines around mouths, or worried furrows on foreheads. Solomon’s works present a view of the urban environment, and, within that realm, of the people that inhabit the spaces around him. In his second solo show at Kristin Hjellegjerde, Silence (6th of January – 3rd of February 2018), he presents all new works, musings that have taken on a darker turn, as he parses through thoughts on life, death and physical and mental boundaries. Within Solomon’s works, people and places come together to create a fictional world that exists beyond the present; a reality that is free from the limitations of anecdotal recordings of Solomon’s experience. The motif of the chair appears repeatedly as well, representing past, present and future authority. Indeed, in much of his work, Solomon presents his observations through symbolism and use of archival material, providing personal and political narratives beyond his locale. This new series, however, examines ideas of mortality and borders, freedom of expression and standing up for social injustice. Chairs are replaced by raised fists and guns, gestures of both violence and defiance, the juxtaposition between the tactile, permanent nature of the woodcut and the intransient idea of life and death creating an ever starker break in the relationship between material and concept, as our material, mortal lives seek to reach out and touch what is ever out of reach – life beyond death. These works are the product of a year that has witnessed the artist spend ever increasing time by himself in silence, producing a series of works meditating ‘out loud’, as it were, on concepts of life, death, freedom, faith and happiness. They touch on borders – between people trying to get from point A to B, issues of travel and migration, as well as national boundaries – both physical and mental. Together, these blockades limit the free flow of human experience as they curb our ability to be creative individuals without hindrance. Solomon also ruminates on mortality, spurred by the tragic passing of a family member. “I have experience the silence in death,” he explains. “The fact remains that death is the end of life… or at least life as we know it. Death, dying and the afterlife are all shrouded deep in mystery, cloaked in darkness and generally surrounded by fear and apprehension.” The fear we feel towards this last, unknown barrier brings on feelings of powerlessness in the face of forces far greater than we can control. Death need not be a source of such apprehension, argues Solomon, for within this final act there is also beauty and the ability to re-examine our own perspective of life, and what is important to us in the here and now.